To mark 2015’s very first issue of Khush Wedding, we chose to celebrate Indian heritage and old world charm by employing contemporary features alongside classic ethnic finishes. Kanjivaram is the gold standard of sari fabric, favoured by brides across the Subcontinent who wish to make a luxurious statement, so we’ve used the whole nine Champagne-coloured yards to dress stunning cover model Sara Aras. The merest hint of colour on the border is all the sari needs - anything more risks detracting from the sublime quality of the garment. 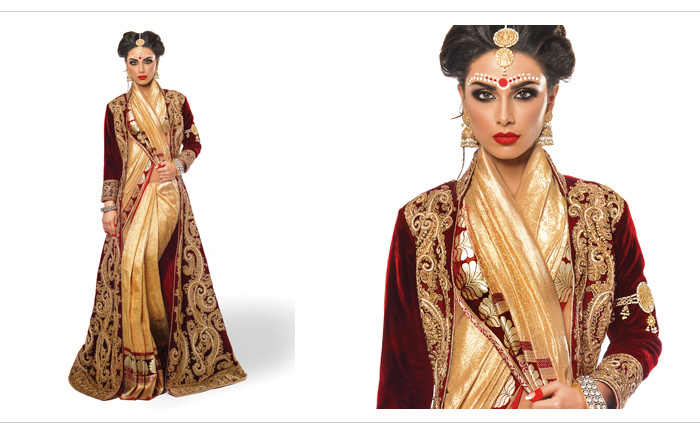 Style-concious brides should take note; Kanjivaram is set to be one of the key trends in Asian bridal wear for 2015. Zarkan of London’s full length velvet jacket was the perfect partner to the simple but stunning sari. Embellished with antique gold stitching and zari work, the ornate jacket gives an air of Queenly magnificence, ensuring the wearer looks and feels like royalty. Zarkan of London’s bridal boutique in east London is a polished emporium of some of the finest wedding and occasionwear collections in the capital. Carrying everything from saris, shalwar kameez and embellished gowns with contemporary and traditional designs inspired by the catwalks of the Subcontinent, Zarkan of London has something for everyone, whether you’re the bride-to-be or a guest at an upcoming wedding, whatever your style or budget. The fashion house even offers customers lessons in sari draping, showing you how to pin and fold the fabric to ensure your look is on the cutting edge. With a traditional Indian bride as our muse, we decided to place importance on the bridal beauty look by opting for cultural makeup complete with gilded lids to enhance Sara’s almond eyes and warm complexion. 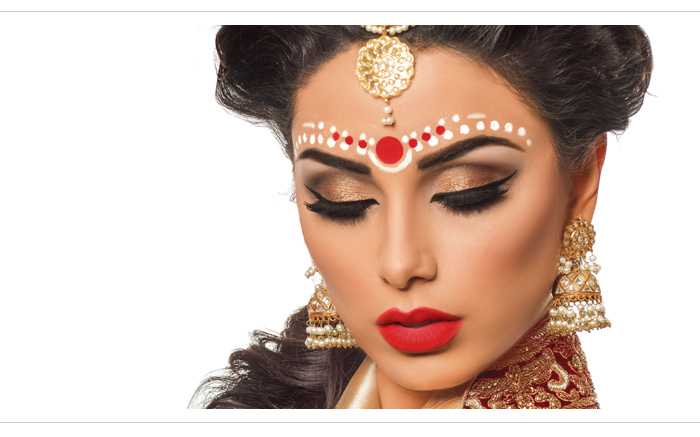 Strong contouring with bronzer and highligher and a matte red lip achieves a true ethnic look. Continuing to use traditional cues as a springboard, the Khush Creative team decided to mark the forehead with a bright red bindi, which signifies a newlywed bride, along with white tilak dots derived from the Indian city of Kolkata. This completes the overall look of a modern bride using time-tested details to honour cultural traditions as well as her personal style. With an esteemed career spanning six years, east London-based Julie Ali has oodles of experience in updating traditional looks, which made her a natural choice as our front cover makeup artist. Her impressive portfolio has seen her hired to work alongside beauty behemoths L’Oreal for designer Eva Garbara at a Paris fashion show, as well as high fashion and editorial makeup campaigns. Julie Ali’s inspiration comes from mainstream pop culture as well as the screens of Bollywood, Asian fashion labels, catwalk shows and art. She says: “Fashion is my muse. I love recreating looks that inspire me.” The talented makeup artist is also an ace at creating stylish hair styles, perfect for weddings and other special occasions, providing a fully comprehensive service for her clients. After much consideration, we found Jewels N Gems’ collection worked best for our Spring look and brought our vision of a traditional bride to life. No Asian bride is complete without the customary ornaments and this is why we chose a Mehreen Haar to adorn the front of the gold sari. The pearls on the Haar add a lustrous, elegant glow, hinting at her noble background. Jhumkas (earrings) are a very big hit for SS15 and we wanted to use this on the cover to add a sense of glamour. A Kundan tika stays true to the inner essence of the heritage-loving bride. A few Kare bangles were all that was needed to finish the full length sleeve, and the mirrored patchwork details on the pieces continue to contribute to the royal feel, in keeping with the overall theme. And finally, the Meena and Kundan Nath completes the look, as the final jigsaw piece to this entirely beautiful and ornate ensemble. 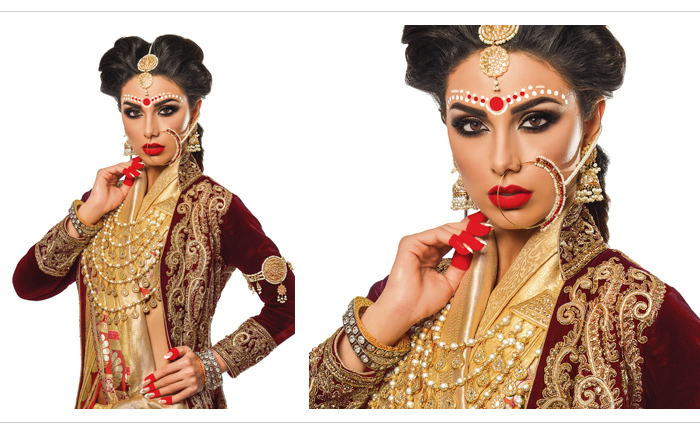 Esteened northern jewellery house Jewels N’ Gems has been delighting British Asian brides and grooms across the globe for two years with stunning collections of wedding and costume jewellery, hair ornaments and other show-stopping accessories. Each piece is handcrafted by skilled workmen and many of the fabulous pieces in Jewels n Gems’ collections are bespoke, allowing brides and their families to put their personal stamp on each piece and ensure that they are as unique as the wearer.